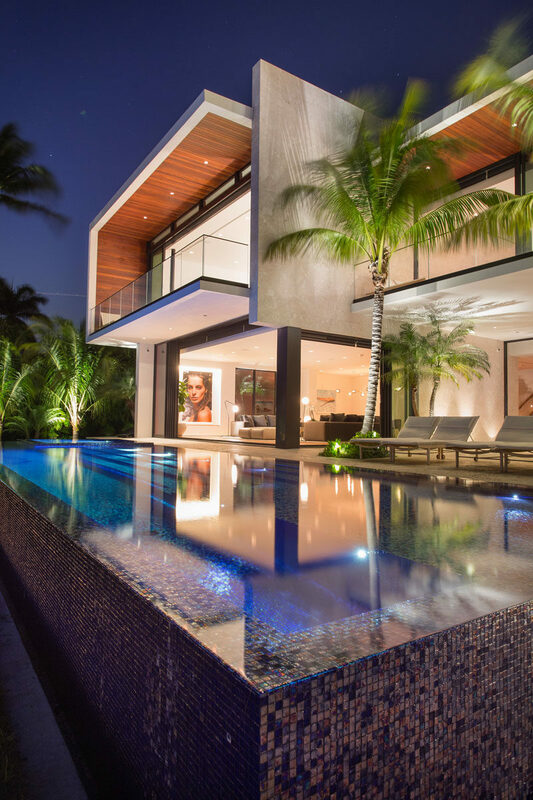 Choeff Levy Fischman have designed a two-story Miami Beach waterfront residence that focuses on indoor-outdoor living. 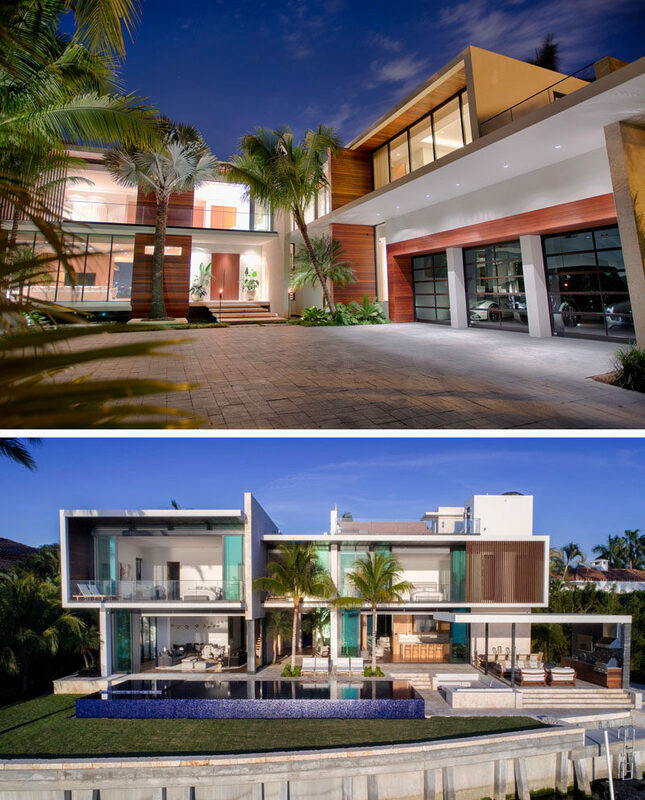 The concept behind the design was tropical modern with a heavy influence of mid-century modern architecture. Structural elements were kept thin, and exterior faces were designed to be as wide open as possible in order to maximize the views. 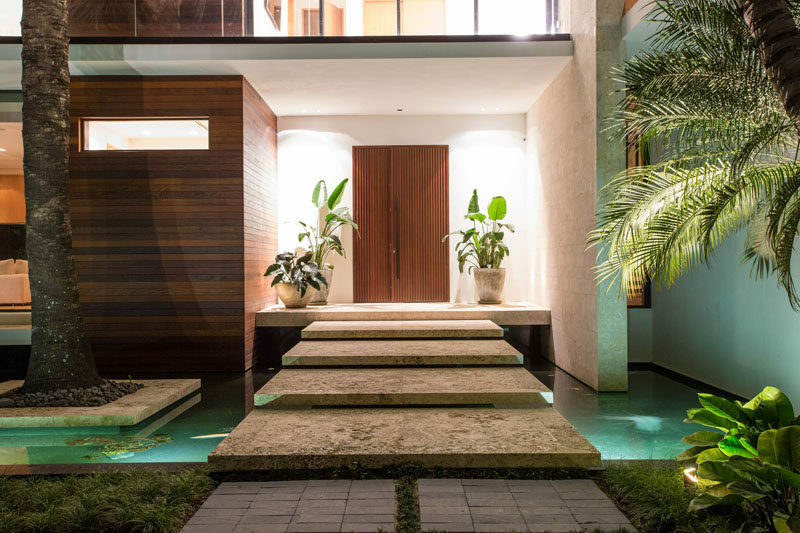 Upon arriving at the home, there’s a small bridge to cross above the reflecting ponds, before reaching the wood front door. 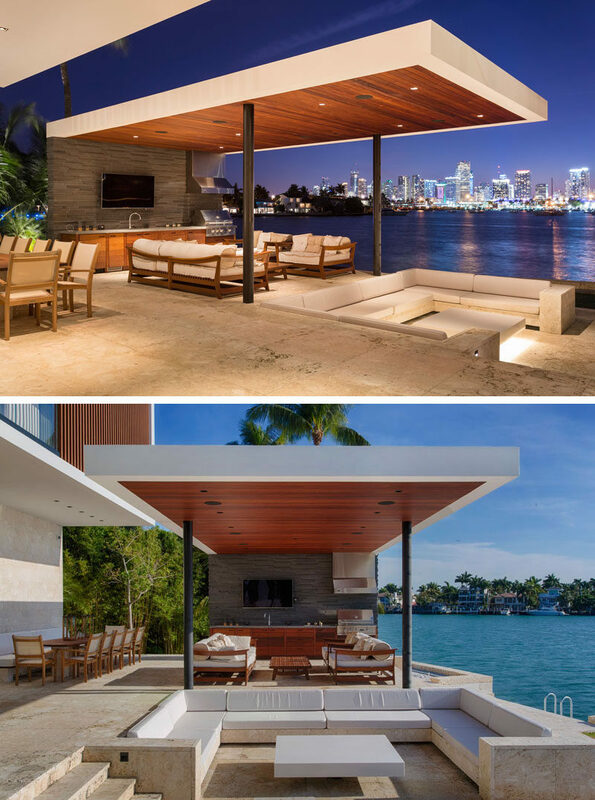 Inside, the living room has been positioned to take advantage of the views of Downtown Miami and Biscayne Bay. Large sliding glass walls were vital for the interaction between indoor spaces and outdoor spaces. An infinity-edge pool in the backyard is surrounded by limestone decking, which contrasts the iridescent blue tile used in the pool and spa. An outdoor kitchen and cabana can also be found at one end of the pool, along with a mid-century style conversation pit. The sunken outdoor living room sits beneath the level of the pool, and is located between the pool and the outdoor summer kitchen and dining area. The interaction of the sunken pit with its neighbors, the pool and cabana make for an interesting social space. 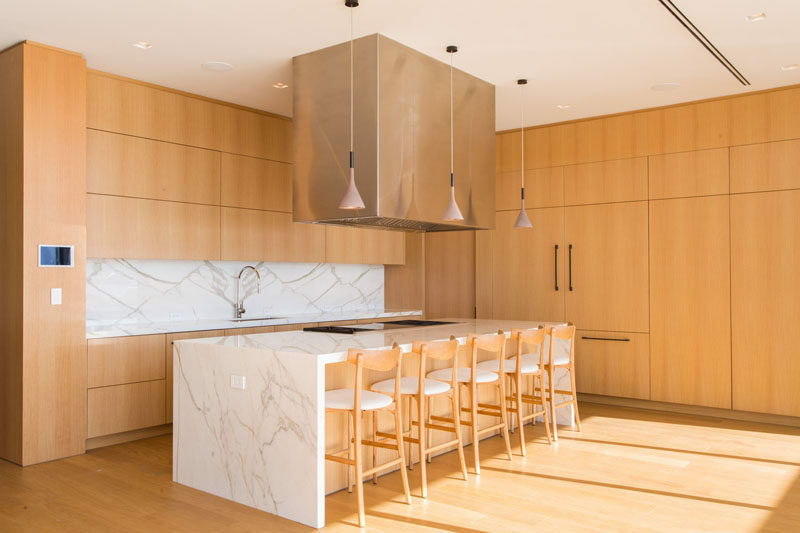 Back inside, the a light wood has been used for the kitchen cabinets, while the stone island ties in with the countertop and backsplash. 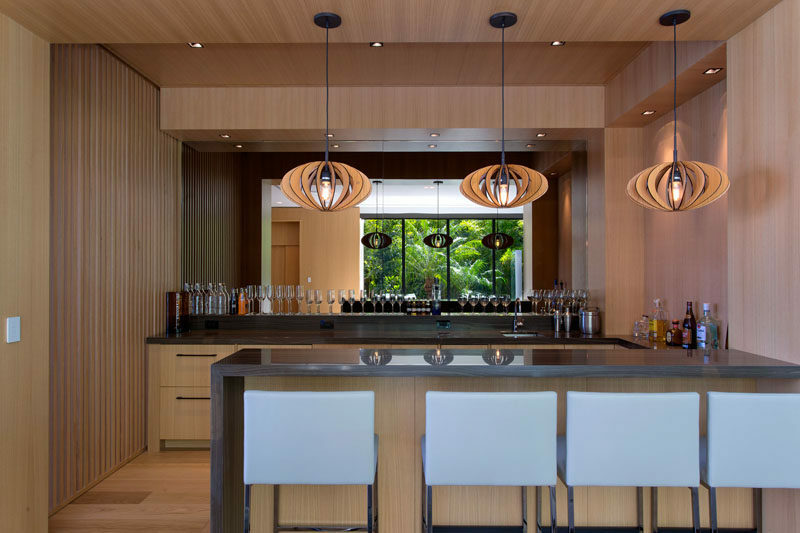 The home also has a bar with a mirrored backsplash. 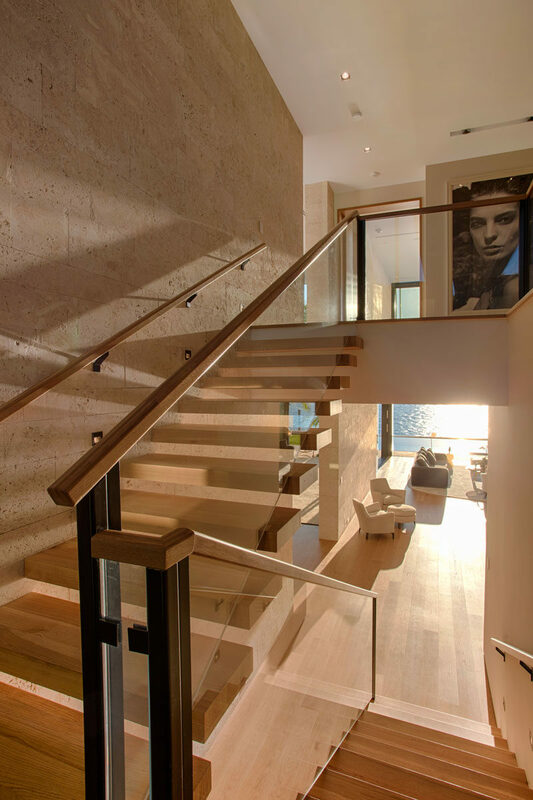 Throughout the home, stained Ipe wood and South American stone have been used to add a warmth to the otherwise modern interior. Wood stairs with glass railings connect the various levels of the home. In the master bedroom suite there’s a small home office area, a sleeping area and a lounge. The bedroom opens up to a private balcony, for even more living space. In the master bathroom, a freestanding bathtub is positioned by the window, while a stone accent wall matches the vanity countertop and a wall in the shower. Here’s a look at the bedroom from the outside that shows the private balcony and the retractable glass wall.